With two other members of the Change for Climate (C4C) project – Berina Kılıçarslan and Beyza Özel – I have had the chance to organize two stimulating World Climate events in Turkey. Indeed, our eco-political and social initiative, C4C Project, has made significant progress in only ten months. Our first World Climate targeted university students and young professionals, while the second one, conducted in January 2017, targeted younger youth in high school. There is evidence of climate change in Turkey. Turkey, where more than 900 extreme climatic incidents occurred in 2015 (Algedik et. al., 2016), is also one of the countries in which young people are suffering from misinformation and inadequate educational programs on climate change. Although the Turkish government announced a projection of a 326% increase in greenhouse gas emissions by 2030 (Algedik et. al., 2016), neither young people nor the rest of the population have an idea about what this dangerous policy means for their country and the planet. In fact, the lack of awareness among youth is a natural outcome of Turkey’s recent so-called climate policies, which are designed to build up new fossil fuel plants by 2030. On the other hand, and not surprisingly, educational institutions in Turkey are not taking the responsibility to provide young people with sufficient courses on the position of Turkey in global and local climate change agenda and actions. Therefore, Anatolian youth do not have reliable and large-scale access to national and international climate developments except for some on-going non-governmental efforts which can be counted on the fingers of one hand. World Climate bridges the gap for climate education. 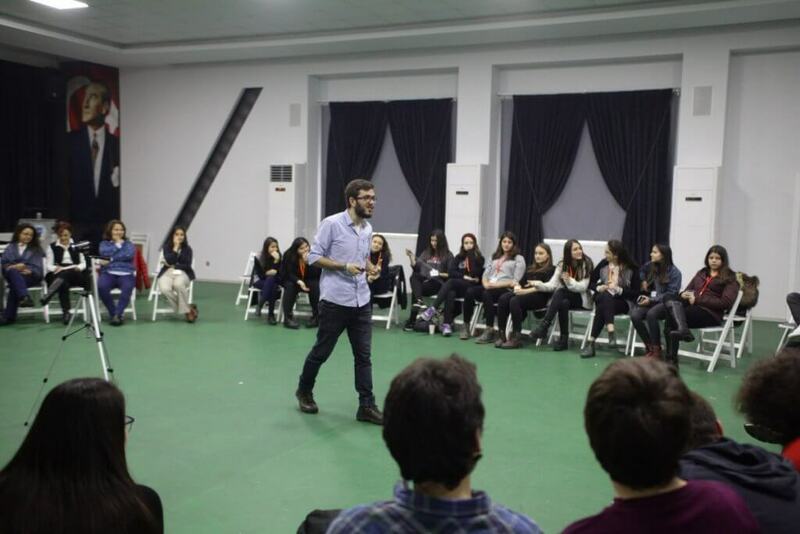 As an innovative alternative to close the educational and political gap of Anatolian youth, the World Climate Simulation was organized on 4th January 2017 by the Change for Climate (C4C) Project, PEV Private Schools and The Platform of Systems Thinking in Education. 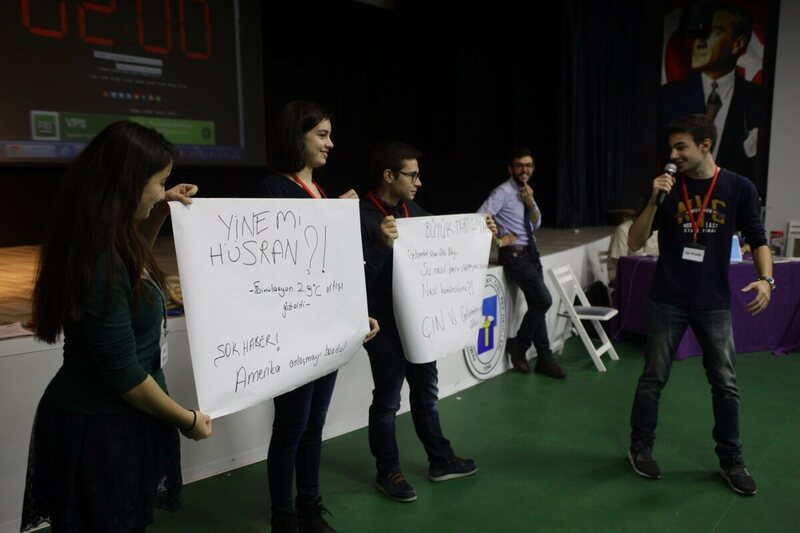 Approximately fifty high school students joined the second World Climate event in Turkey in Denizli City. Our first World Climate event had been held as part of a training course of C4C Project in Ankara under my guidance in 2016. Since most of our C4C activities target university students and older people, we initially worried about how we would convey climate knowledge to the high school students in this year’s World Climate. As the Turkish education system has a very formal foundation, it is really hard to integrate primary and secondary students into non-formal learning opportunities. However, World Climate offers an experiential learning approach. The first impressions and participation of the high school students was amazing. The participants were very motivated to understand what is happening with their climate, the planet, and especially with their future. Before the World Climate Simulation started, participants were asked to fill in the pre-surveys, a research initiative of the UMass Lowell Climate Change Initiative assessing the learning outcomes of World Climate. This was followed by a presentation called Climate Change 101, which delivered basic principles of climate science to the participants. Then participants were assigned to the nine core roles of the negotiation game. Probably, the most pleasing thing about the day happened when the participants adopted their roles as soon as the first round of the role play started. Thanks to the strategic room arrangement (i.e. garish tables for the developed countries or materials supporting creativeness of the additional roles) which were made by PEV Private School staff, the high school students were transformed into zealous international climate policy makers in a short while. The simulation ended after four rounds of negotiation, with heated discussions and negotiations from throughout. At the end of the first round of negotiations, the policies of the parties resulted in a 2.9 °C temperature rise using the C-ROADS World Climate software. The climate activist and fossil fuel lobbyists became more influential in the following rounds, causing the negotiators to change their positions. After a significant increase of their integration into the negotiations, the second round resulted in 2.4 °C while the third made it to 3.2 °C. Finally the fourth and final round of the negotiations yielded a 2.2 °C projection in global temperature rise by 2100. 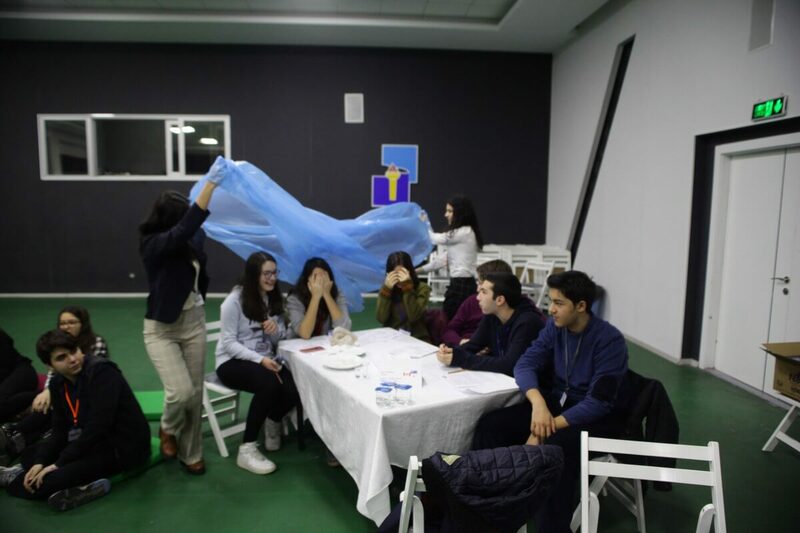 After this series of busy climate sessions, PEV Private School’s students got to know more, not only about climate science, but also about international climate politics (possibly for the first time in Turkey’s secondary schools). To make their experience more meaningful, we conducted a forty-five minute debrief session which we enhanced by showing as the video “President Obama: Our future is on the line” which was released by the Alliance for Climate Education (ACE) with the purpose of instilling “climate hope” to our participants. With this video about an ongoing climate lawsuit by a group of American high-school students against the government of United States of America, our participants observed how it is possible for young people to join decision-making processes as a part of the global climate change struggle. Through these simulations, we have seen and now believe that such experiential learning processes indeed produce new ideas in terms of addressing climate change to high schoolers, as well as ourselves. As one the World Climate ambassadors, I hope we can keep reaching new target groups and creating awareness that climate change is a devastating ecological tragedy for our communities and that we need to take urgent action.